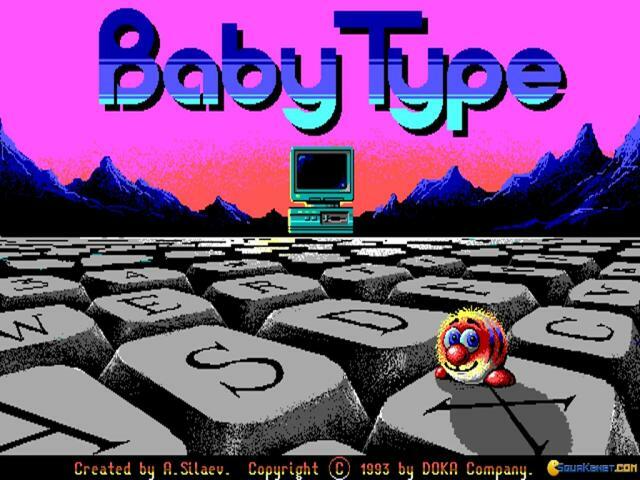 In Baby Type your main mechanic is typing the phrases and letters that appear on the screen, and these simple commands are translated into all sort of actions in the gaming world. Therefore, while at the surface the game might look like a simple left to right platformer, advancing through the levels, shooting enemies, jumping and other actions as well are performed by typing not by direct control. You have to type your letters and words at the correct time though, and you have to avoid mistakes, so, the further you progress, the more you'll be challenged to type without actually looking at your keyboard. Therefore, the game creates a very interesting platform for simple and later on more complex learning of the layout of a keyboard, forcing you later on to manage typing without looking at the keyboard. But, if you can't yet achieve this kind of freedom, that's alright, a good chunk of the game will allow you the time to check the screen and look at the keyboard at the same time. So, this sort of edutainment game is just right for anyone looking to improve their speed of typing while looking forward to learning to type without checking out the keys.